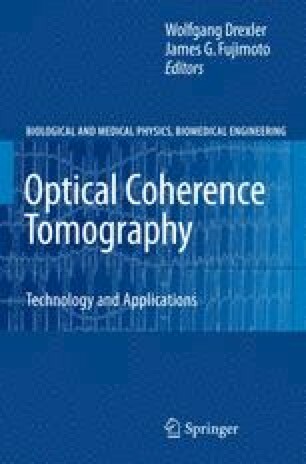 Since its invention in the late 1980s [1–4] and early 1990s [5–7], the original idea of optical coherence tomography (OCT) was to enable noninvasive optical biopsy, i.e., the in situ imaging of tissue microstructure with a resolution approaching that of histology, but without the need for tissue excision and postprocessing. An important advance toward this goal was the introduction of ultrahigh resolution OCT (UHR OCT). By improving axial OCT resolution by one order of magnitude from the 10–15 μm to the submicrometer region [8–11], UHR OCT enables superior visualization of tissue microstructure, including all major intraretinal layers in ophthalmic applications as well as cellular resolution OCT imaging in nontransparent tissue. This chapter reviews the state-of-the-art technology that enables UHR OCT covering the entire wavelength region from 500 to 1,600 nm and discusses fundamental limitations of OCT image resolution.